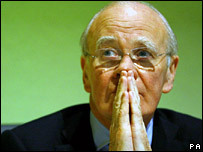 Liberal Democrat leader Sir Menzies Campbell has attacked Britain's "dependency culture" and said more single parents should be seeking work. People should be given education and a chance to help themselves, but instead millions were being trapped into living on benefits, said Sir Menzies. He said lone parents should return to work when their youngest child is 12 - not 16 as currently. And he said he wanted to end the "bias" against couples in the tax system. Among ideas would be to introduce a "couples' premium" into the child tax credit. He also wants to simplify the welfare system by halving the number of benefits from 50 to 25. And he said the Liberal Democrats wanted to increase child benefit for all children, to the level of the firstborn, at a cost of £1.7bn. "Gordon Brown's strategy of mass means-testing is undermining work, saving and families," he said. "It is not sustainable - it risks trapping millions of people in a dependency culture. "We should be giving people an education and a chance. Instead, we are giving them a benefit book and a 30 page claim form. "Unless we create a society where the state assists people to improve themselves we will never be able to eliminate poverty." He said questions ought to be asked about a benefit system which provided little incentive or support for lone parents to return to work, until their youngest child was 16. In most other European countries the age was "considerably lower", he said. Returning earlier "might discourage dependency and reduce child poverty too", Sir Menzies said. Sir Menzies said the party must "take the fight for a fairer Britain into the mainstream of British politics and into the heartlands of the Labour Party". Last week, Conservative leader David Cameron said couples should be "encouraged to get together and stay together", possibly with the help of changes to taxation. This followed a report by ex-Tory leader Iain Duncan Smith which said family splits caused social problems costing £20bn. In October Work and Pensions Secretary John Hutton pledged a "new deal" for two-parent families, saying they had been largely invisible because all the help had been focused on lone parents.